It is with great pleasure that I write a letter of recommendation for Dr. Anantha Presad Holla. Dr. Holla is very knowledgeable and passionate about caring for individuals living with vitiligo in a holistic manner. Dr. Holla’s qualities of focus, compassion, and education are embodied in his understanding of the many patients who are diagnosed with vitiligo and do not understand what is going on with their bodies internally and externally. Dr. Holla dedicates the time to educate patients about the vitiligo cycle. Dr. Holla's management protocol for vitiligo is to handle the patient individually and he does not rush to give you a pill or quick fix. He goes over the pros and cons of various holistic and new treatment options. Dr. Holla’s care and service will be a valuable option for people with vitiligo. He has created online accesswhere patients can reach him for consultation. Vitiligo Bond Inc., a 501 (3) (c) non-profit organization is excited to collaborate with Dr. Holla as he brings his holistic management approach to vitiligo care for the many vitiligans who are hopeful for a cure. I recommend Dr. Holla with my highest level of enthusiasm. Dr. Holla feel free to write a recommendation for my organization as well. (You can talk about how we promote awareness of vitiligo and the need for it). I would appreciate it. Thanks. "Firstly, Let me take this oportunity to thank Dr. Holla and his MelanoSite team for giving a new confidence to my life. My Problem with the vitilogo started since my childhood and from then i had tried many other treatments (Homeopathy, ayurvedic,etc ) but there were no good results or a permanent solution to my problems at all. What more to say? it remains same as how it was. Now i am 29 years old and planning to get married next year . I was really not prepared or having enough confidence to get married just because of the vitilego white patches on my leg bothered me a lot. It was in a "google" search i came to know about DR.Holla and his MelanoSite Team as there are no many in india who are succesful with this treatment. I still remember, I have first approched Dr.Holla through a mail for a " permanent tatooing " inorder to hide this patches. But Dr.Holla corrected me with a convincing mail about the possible consequences of "tattooing colour mismatch" and gave a clear and confident explanation about the most advanced succesfull treatment "cellular transplantation" in vitiligo patch which will give the natural colour to the patch within few months. To be very frank, his reply on that day gave a new hope and confidence to my life. It was in a hospital at cochin , I consulted Dr. Holla and he evaulated and explained about the procedure of his treatment. The whole procedure and the treament was done on the same day and thereafter a week rest at home. Moreover , The dedication of his team never ends. 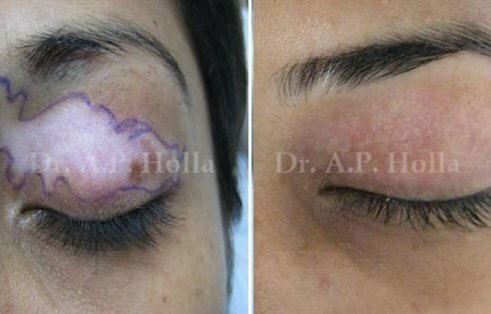 As i am in cochin and working abroad , Dr. Holla's team regularly contacted me over mobile , whatzap, and mails to know about the progress of the colour change and keep advising what all things to do and how to take care until i got the full natural colour on the patches. Now its almost 3 months after the treatment procedure , i regained the true natural color to my problems (Vitiligo patches). Once again i thank Dr.Holla and his melanosite team for the support and help so far and i wish all the very best for a more succesfull stories with Melonosite. Lastly, I would like to recommend / Refer to "Dr Holla and Melonosite team" for all who are facing problem with Vitiligo in your life." Yes! ur at the right place where vitiligo can be treated in a right way with great results. am UBAID living in Dubai came from Karnataka , I had vitiligo past 22 years ,I have tried many types of medicines like homeo, allopathic ,ayurvedic and online medicines also consulted many Dr’s in my past 22 years the result was waste of time and money .. 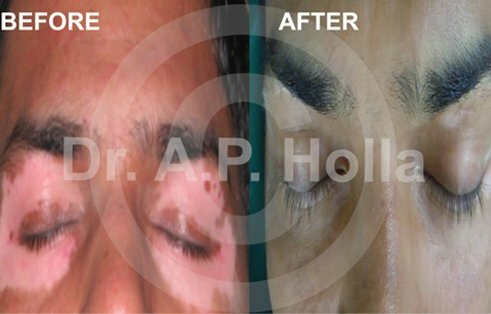 Thanks to almighty, finally I consulted DR. HOLLA in DELHI he is the first Dr who gave me a positive hope also they provide great hospitality to their patients , I underwent surgery , now am totally cured I got normal skin color in just 3 months! Its my pleasure to recommend my Dr. Anantha Prasad Holla to YOU . he is a professionally expert vitiligo surgeon in the world . I wish all the success to his upcoming researches and plans.. Thank you so much for the wonderful treatment. I was suffering from vitiligo since 2006. 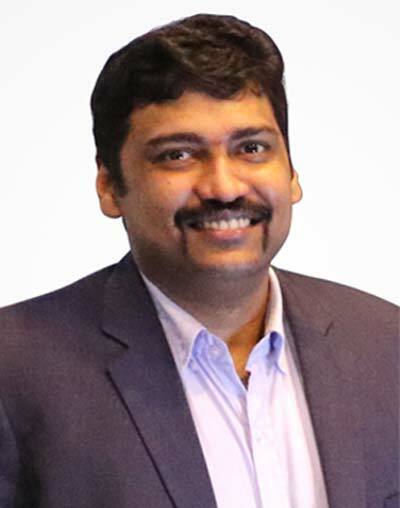 I had literally been through hell & i was getting a bit fed up of trying out all the different treatments on offer.Then came to know about Dr. Ananth Prasad Holla,melonoasite & consulted him.I had white spots on the area around both the eyes,lips,chest,back,hand.After consulting Dr.Holla,within few days later i could see that my skin was changing.Today i am happy to say that i have got around 95% regimentation. 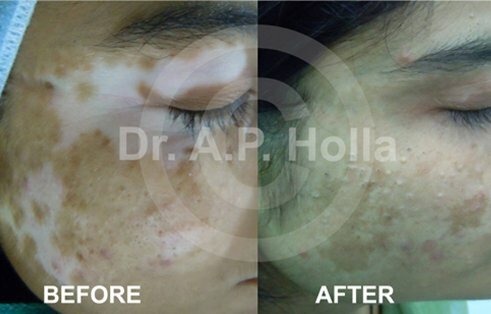 I truly believe that Dr.Holla has an effective cure for vitiligo & his services for the benefit of anyone suffering from this condition.We are extremely fortunate to have Dr Holla at a critical time when we were running out of time for marriage.Now my marriage is fixed & am thankfull to Dr.Holla. 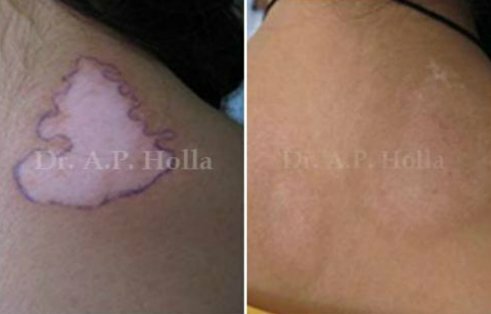 I think Dr.Holla's treatment is a good news for the patients suffering from vitiligo & can be of great relief as it removes all the stress & disappointments in their healthy life.I would like to thank Dr.Holla for giving a new hope of life & for his great services to the society. For the last seven years I had problem of vitiligo. In the beginning I got cured in few months. I consulted many doctors in the last three years (before I met Dr. Holla) I was like an experimental animal. Nobody will tell you, if they don't know the exact treatment for the vitiligo, instead of trying some vitamin tablets. After few months only we will realize, treatment is not working. I was very depressed due to my patches, because all were in visible parts. With God's grace, fortunately I saw the advertisement in facebook about the MelanoSite. I visited Dr. Holla's website and I emailed in detail about my previous treatment and the present stage. In the first consultation, Dr. Holla explained all about the vitiligo, causes and stages of treatment. I satisfied with his treatment in the first visit, because of his stage by stage treatment. He confirmed my vitiligo is generalized. 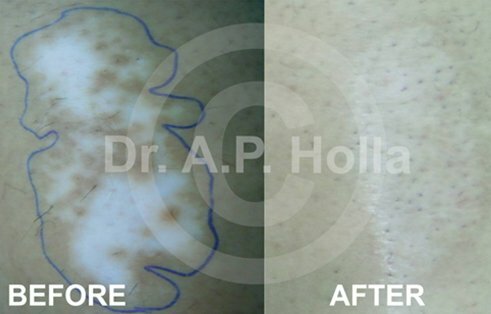 I am very happy to get a good result from Dr. Holla's treatment and not get any new patches for the last six month. 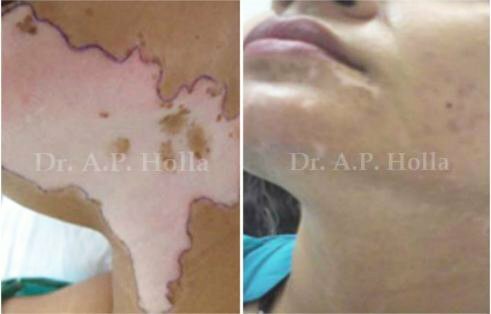 Furthermore, 90% of patches got pigmented and I have 100% trust in Dr. Holla's treatment can cure my Vitiligo. "My daughter was diagnosed with Vitiligo two years ago and we tried several natural and western medical treatments without any results. I came across Dr. Holla and his published works while researching on the Internet and contacted him six months ago. I spent an hour on a skype consultation with him to learn about his approach and treatment options. Dr. Holla is well informed and his methodical approach to treat the affected areas from inside and out is clearly evident in my daughter’s progress in re-pigmentation. 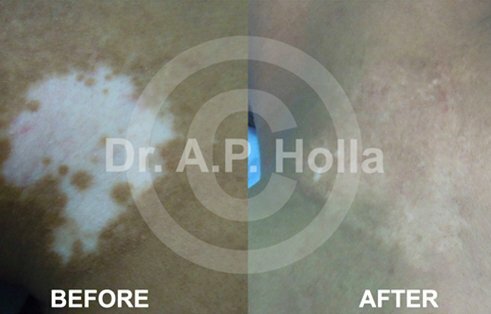 We are fortunate to be working with Dr. Holla, who particularly specializes in vitiligo treatment. He gave us hope and has been very supportive during the whole process, with periodical skype consultations during the treatments. 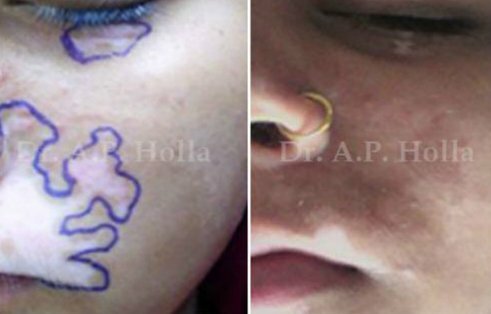 Vitiligo treatment is a long journery, but with Dr. Holla’s help I am convinced my daughter will heal completely in due course". I started having small white patches around the neck area and forehead in the year 2000. I consulted a renowned dermatologist in Ranchi and had some improvement, but that started spreading again. 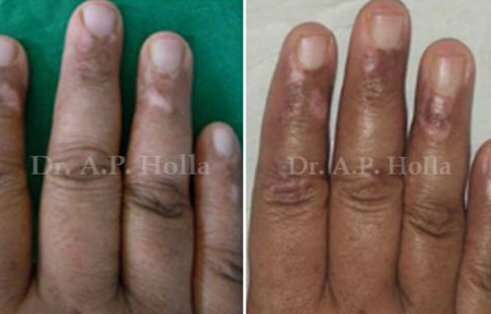 The area of depigmentation increased around the neck, forehead and in new places like fore arms, left arm pit, backside of thighs, fingers and foot. On the suggestion from friends, I consulted renowned homeopaths in India, including the leading one that advertises in the print media, but all with no relief whatsoever. In May 2013, I was advised by one of my friends about the relief that his daughter had with the treatment of Dr. Holla from Melonosite, New Delhi. I first consulted him in July 2013, followed with the treatment he prescribed and continued to consult him as per his advice. To my satisfaction, within 3 months, the patches in forehead were gone. The patches around the neck, below the arm pit, fore arms and thighs started to disappear in 6 months of his treatment and by July 2014 (within one year), they have all gone. Only some patches on the fingers and feet are yet to go, but they are fading out with the signs of pigmentation in them. I found Dr. Holla addressing the ailment methodically, based on the medical science, and prescribing as per the individual patient’s condition. This is the reason why I must have had such a positive response and relief from Vitiligo, which, by general perception is difficult to treat for.I pray and wish Dr. Holla to succeed in the field of his research, specialisation and bring relief to many more too, who suffer from this ailment.